President Donald Trump tweeted Wednesday that Republicans would “totally” protect people with pre-existing conditions, trying to fend off Democratic attacks on GOP Obamacare repeal votes. “Republicans will totally protect people with Pre-Existing Conditions, Democrats will not! Vote Republican,” Trump tweeted. Republicans in tough races have been scrambling to say that they will protect people with pre-existing conditions as Democrats use the issue and GOP votes to repeal Obamacare as a key line of attack. 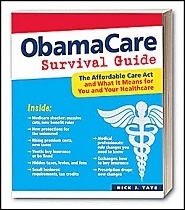 Get the Obamacare Survival Guide today! ObamaCare will affect every single American, but few know what exactly the 2,700 page law actually says. Now, the ObamaCare Survival Guide, written in plain, easy-to-read language, makes the law simple to understand and gives you the tools to navigate ObamaCare.